The plums are beginning to ripen. I pruned this tree a little severely this past winter, probably too severely for a youngish tree, but I wanted to get started early on good structure. And the tree has rewarded us with some lovely-looking fruit. I've started picking them when they reach this color, and bringing them inside to soften. The squirrels are diabolical this year. 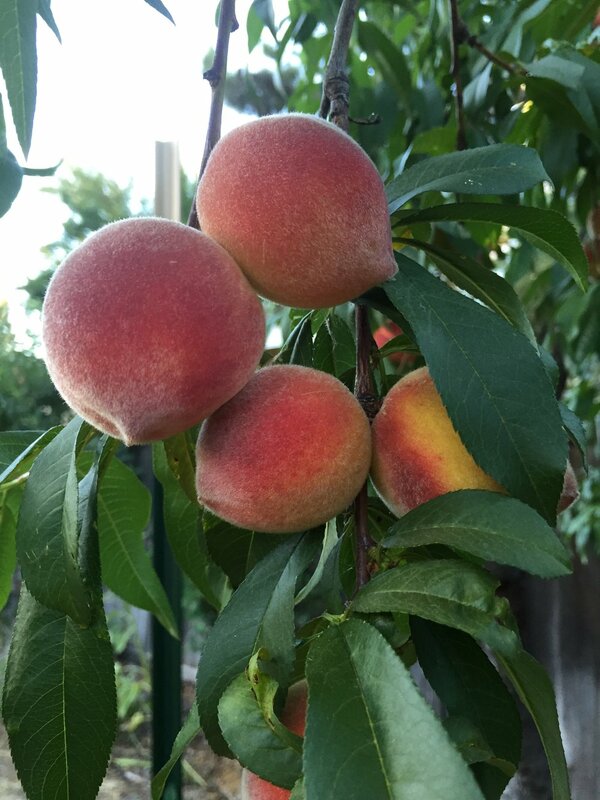 I'm doing the same with the peaches, because I'm finding several half-eaten ones every morning at the base of the tree (they go to the chickens). The fruit this year is on the small side, but a good volume. I haven't sprayed it for peach leaf curl now in two years - there is a little bit of the disease on some of the leaves, but so far it's not terrible, and we still have a good harvest. I don't want to use that copper spray any more, so if this tree begins to suffer badly, we'll just remove it and try again with a resistant tree. The tree is at least 20 years old, maybe more, so it's a miracle it's still producing this well. Anybody else have this? I think it's a disease called 'Leak,' caused by a pathogen that likes saturated soil and warm temperatures. The three potatoes I found with this rot were in very saturated places in the raised bed. I'm not sure if there is a leak in the drip line, or it it's just naturally wetter on that side, but we certainly have had some very warm temperatures at times, so this could be it. The trick is not to plant potatoes in this same place next year, to avoid this pathogen. I've had potatoes in this particular bed every year for a while now, so I need to change locations. I'm not sure if I should go ahead with a pea crop in that bed, or put in a summer cover crop to heal the soil. 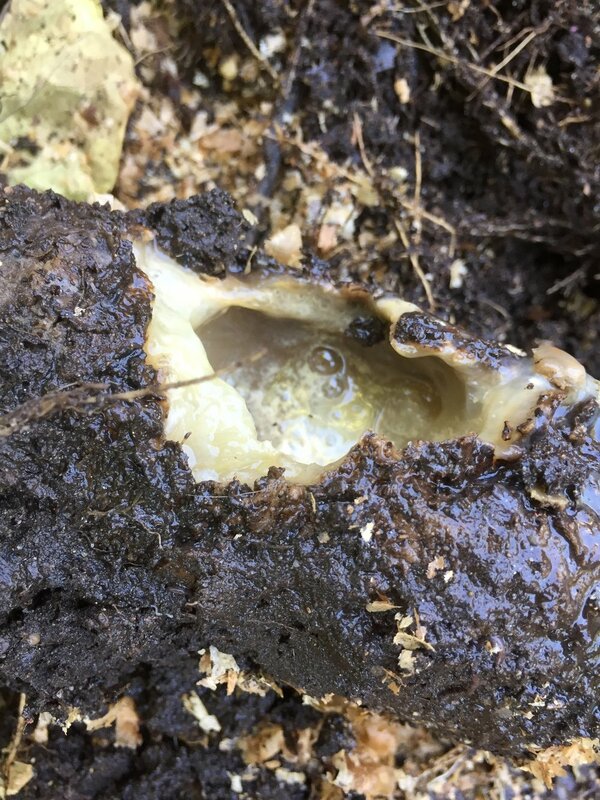 When I was digging out the potatoes, the soil was really compacted, though absolutely full of worms. I mixed in the coffee chaff that I used as a mulch, and I'll probably cover it with a couple inches of compost, and let the bed sit for a couple of weeks. Then I'll decide what's next. Meanwhile, I'll fix roasted potato salad for a pot luck tomorrow night, and we can enjoy the rest however we like (hash browns! roasted with olive oil and salt! mashed with butter!). It's fun to have our own organic potatoes. They taste so much better than store-bought.